Enriched with Dead Sea Minerals. Hydrating and Conditioning for Control and Shine. Our Leave-in Styling Cream is Enriched with revitalizing Ginseng, our hair-styling cream is an innovative solution to course, untamable and flyaway hair. With its light texture, Achieve incredible results by applying before a blowout. It adds shine to your hair while defining and holding your curls in place without fluffy strands or leaving a heavy residue. 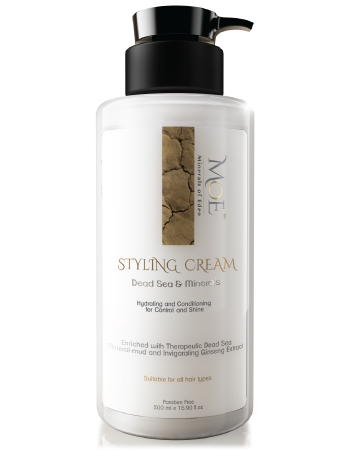 Blended with 26 therapeutic Dead-Sea minerals, this cream will nourish and protect your hair while blow-drying and styling. For Incredible results before a blowout. Massage between your palms and Apply from roots to tips on wet or dry hair. As well, after styling to define curls, control flyaway ends and to create shine. The amount of cream you use depends on your hair type. Very curly, coarse and hard to control hair will need a larger amount.